All featured image(s) copyrights reserved to MIC Buzz Limited and Salsabuzz Limited image provider(s). 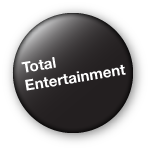 We create beautifully choreographed routines to beautifully selected music, to suit the bride’s and groom’s body types, clothing and abilities. The selected music is usually a lovely bolero, slow smooth son, or a soft gentle salsa song. We then combine both routine and music together in such a way, that it is complementary to the bride’s dress and is suitable for the venue flooring and mood required. For such an occasion we do not normally design an energetic dance, although we have sometimes been requested to do so. On request we also design dance routines that evolve, i.e. where the bride and groom wish to transition from ballroom to salsa throughout the wedding dance. 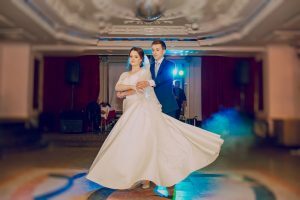 We also design calm, lovely and controlled choreographed movements that give the happy couple a sense of theatre, making them feel and look elegant and beautiful whilst they are dancing together. The good thing about having Salsabuzz & Salsa Elegante at your wedding, is that we can also get everyone else involved on the day. We hold short and quick beginner lessons, enabling everyone to join in, have fun and interact. 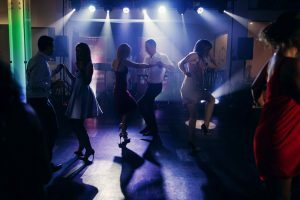 At some weddings some guests do not get to interact as widely with others and/or do not get to have as much fun, however with salsa lessons and dancing the group dynamics enables you to correct this. 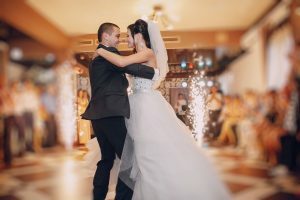 Weddings are a perfect occasions to have our salsa products and services, as we get everybody up onto their feet and dancing as part of the general entertainment and is fun for all.